Messenger Payments is an electronic parental payment system integrated securely within Groupcall Messenger, with additional secure parent access to allow payments to be made by parents/guardians. Way2Pay Limited are a company based in Ireland, and produce the Messenger Payments service. Groupcall have partnered with Way2Pay to deliver an electronic payment system within the Groupcall Messenger EcoSystem. View the Way2Pay privacy statement here. Does Messenger Payments integrate with any other Groupcall systems? Yes, Messenger Payments is fully integrated with Messenger and Xpressions. Just like Messenger, your MIS data will sync automatically with Messenger Payments, giving you streamlined and accurate contact and student data. Staff will be able to use the system by logging into Messenger and clicking the Messenger Payments tile from their homepage. Parents using Xpressions will not only benefit from unified communications on all school related matters, but will also have the ability to pay for activities from the app too. There are no parental usernames and passwords for Messenger Payments, yet the system remains secure, so it's a breeze to setup and use for everybody. Parents can also top up their children’s cashless catering lunch balance (where a compatible cashless catering system is in use in the school). How much does Messenger Payments cost? Typically, most parental payment systems charge an annual maintenance fee, a licence fee, and/or a subscription fee. Schools are then also charged a transaction fee for each payment, which is a percentage of the amount being paid. 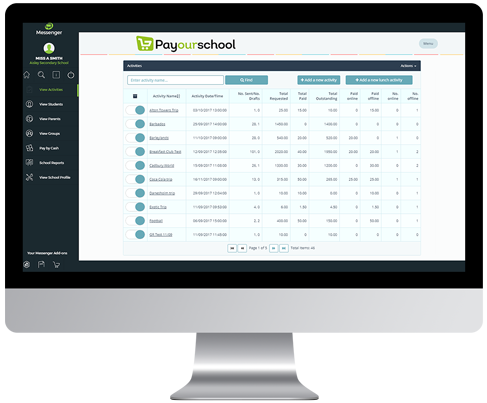 *However, schools using Messenger Payments are not charged an upfront fee, you are ONLY charged a software usage fee, calculated as a % of each payment made (charged to the school). This saves the school significant amounts of money each year. This fee is fixed at 1.5% + VAT of the payment. For further information on how to calculate the total cost of activities, click here. How are disbursements made to the school bank account? When parents make a payment, the money they have paid goes to a central account for processing. The money is then disbursed into your bank account on a weekly basis. You can access disbursement information from the School Reports panel of Messenger Payments. For example you may need to (e.g. to compare total amounts?) broken down individual payments against Ledger Codes). Disbursements take place at 2pm on a Friday. However, in line with standard processing times in the banking system, the funds could take up 2 working days to reach your school's nominated bank account(s). Click here to view the weekly breakdown on how payments are processed and released into your school bank account.Payments included in each disbursement will include all payments not disbursed previously, including payments made, and settled into the central holding account by midnight on the Monday of that week. Payments made after this time will be included in the following disbursement. Is the Messenger Payments service liable for VAT? Yes, because a service provided to accept money conveniently from your parents to your school accounts is liable for VAT in the UK. Most educational establishments can claim this VAT back via tax declarations. As you are aware, there is no licence fee, maintenance fee, or other recurring charge to use Messenger Payments. The only fee to pay is a per-transaction charge of 1.5% of each non-cash transaction. VAT is applied at the standard rate (currently set by the government at 20%), and is applied to the transaction fee ONLY - so this is 20% on the 1.5%. On cash transactions there is no per-transaction charge and hence no VAT to be applied. To ensure robust VAT compliance, the VAT will be collected on your behalf at the time of the transaction and deducted from your disbursement of funds, the same point as when the 1.5% transaction fee is collected. This means no additional VAT will need to be paid or accounted for at the end of the financial year or in your tax returns. The money disbursed to your school account each week will be the value of the payments, minus both the transaction fees and the VAT on the transaction fees. This is no different to paying the VAT for the Messenger system or other software. 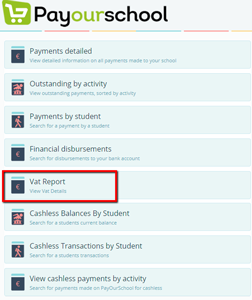 To aid in VAT reclaim, a VAT report is available from within Messenger Payments and will have all the information to hand on how much VAT has been collected on the school’s behalf for these transactions fees. How much you can claim back is worked out for you in this report, saving your school a great deal of time that would usually be required to calculate such a figure. The report includes the VAT number of Messenger Payments (do not use Groupcall’s VAT number found elsewhere). What is an Activity in Messenger Payments? Simply put, an Activity is something you want to collect payment for. Usually a school trip or similar event, but could be anything that requires payment for students. How do parents make payments? The payment process for Messenger Payments is very simple, requiring no distribution or management of parental usernames or passwords, nor do parents require a dedicated app to make a payment. They simply need access to the internet and a credit or debit card. Full details are available on the parent facing user guide available on our parents site. Messenger Payments does support offline payments made via cash for those parents that do not have internet access or a suitable payment card. 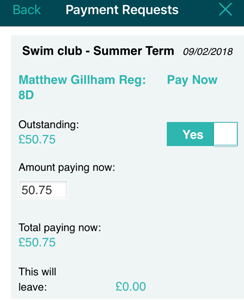 However, this does carry an additional overhead for your school staff (they will need to update the activity balance in Messenger Payments manually), so parents should be encouraged to use online methods. Where does Messenger Payments get its data? Messenger Payments synchronises with your MIS (via Messenger) to gather and update information about students and staff. Messenger Payments act as a sub-processor to Groupcall, in compliance with GDPR. All data is kept and transmitted securely in line with our and GDPR. I can text/email from Messenger Payments – is this separate to sending a message from the main Messenger Menus? Use Messenger as normal to send messages about activities, for example sending letters introducing the trip to parents or reminders that an activity is taking place. However, if your message is about any payments needed from parents, you should use Messenger Payments's inbuilt notifications (such as the creation of a new activity) or ad-hoc messaging functionality. All messages go via Messenger in any case and parents will receive the messages from the same place and will look the same. I have a letter about a ski trip that I want to send. It tells parents that a ski trip is taking place, when it is happening and asks parents to register their interest in the students taking part. Send this using Messenger as normal. You would most likely send this letter as an email to the relevant students, such as a year group or registration classes. From the responses you could then setup a Messenger Saved Group or an MIS group of students that are taking part allowing you more streamlined communication in future as well as the ability to add only those students to the activities in Messenger Payments ensuring only relevant students are invited to pay. I've added a new activity and I need to ask parents to make a payment. Messenger Payments's inbuilt notifications will take care of this for you. When you have set up the activity, simply select 'Save & Bill now' and the messages will be sent. I need to remind parents to make a payment Messenger Payments's reminder service will message only the parents of those students who do not have a payment completed. It's the day before a school trip and I need to advise parents to send certain items (such as a raincoat due to a change in the weather) on the trip with their children. Send this using Messenger as 'normal' using the groups you setup for the trip either in Messenger or in your MIS. Can I issue a refund to a parent? Yes. This is all done from the Invoices Panel by opening the student's record for an Activity in Messenger Payments. What is a Ledger Code / Cost Centre? In Messenger Payments, each activity is associated with a Ledger Code or Cost Centre. This is used by the disbursement mechanism and reporting to identify the destination of money received from parents. It's essentially a way of identifying the type of activity. It could be simply that you have a General code and all money goes here, or you may wish to have granular control and send money for school trips to one bank account and money for school uniform to another. Simply put, an IBAN is a longer version of your Bank Account Number and a BIC is a longer version of the associated Sort Code. The same bank account with Sort Code: 12-34-56 would have a BIC of: NWBKGB2L. We request this information from you during setup of you Messenger Payments account so that we can make settlements to a bank account of the money your parents have paid. They have to be in a standardised format accepted and used across all systems that send (your parents) and receive (your school) money. Your bank will be able to provide the correct details if you do not have them to hand although most banks make this information accessible via internet banking and some provide online help as to how to find this. NatWest for example have this page available.